Winter, Spring, Summer, Fall; Whatever the Season, We Have it All! 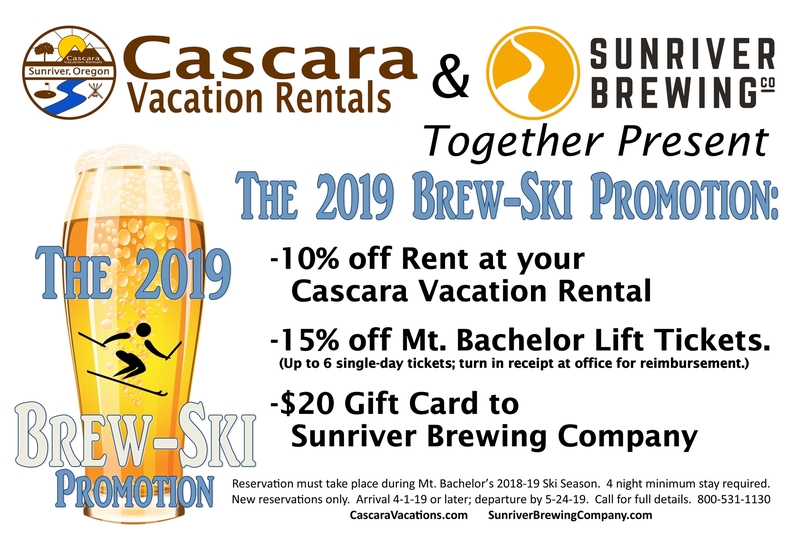 Brew-Ski Promotion Starts 4/1/19 runs through 5/24/19! Memorial Weekend kicks off the start of Summer! It's often Mt. Bachelor's last Hurrah on the slopes. On top of that, to honor those who have served, guests with valid Military ID or Veteran status receive an additional 10% off their rent costs. Get out early and SAVE! We dont start Summer rates until Summer is actually here. So, if you can get an early start, you can save on your Sunriver Vacation! Come explore Sunriver after Memorial Day and before the Pacific Crest event to get in on these early savings!! While Summer is most certainly the most popular time to be in Sunriver, we're still here to make your Summer vacation possible! With many homes that include SHARC access and discounts with local tour guides, Cascara is dedicated to helping you enjoy the Perfect Vacation! Whether its just your family getaway or a family reunion, Cascara can help you find the right home(s) to fit your crew. Add in the partnership we have iwth Lost track Golf Club, the 30 + miles of bike paths and our front desk information center, and you'll be out enjoying everything that Central Oregon has to offer! Spend this Summer Enjoying the Perfect Vacation! Before the routine of school sets in, cap off the Summer with a long weekend in any Cascara home over Labor Day Weekend. Call us 800-531-1130 for advanced booking specials! Call 800-531-1130 for full details! *Discount greens fees available after 12 pm. A $35 value: $25 add on. Includes 3 cans of Sunriver Brewing craft beer. 2 Chilled pint glasses. and a $20 gift card to Sunriver Brewing. The Holidays are a Great Time for Sunriver! Each year, people make Sunriver the place to gather together for the Holidays. Bring your whole crew over to a 5 bedroom home or keep it to immediate family and cozy up in a condo. Typically we have a White Christmas and a fireplace always sets the mood. Need help with Holiday Necessities? Just ask and we can help with a Turkey, a Tree or some other need. Make Sunriver your Home for the Holidays! During Spring Break, Cascara is honored to offer you lower rates! Spring makes a great time in Sunriver as SHARC opens up outside, weather permitting, and Mt. Bachelor is still offering World Class Skiing and Boarding. Come enjoy the sun or snow or whatever weather Mother Nature brings us during that time. Make a Break for Sunriver!